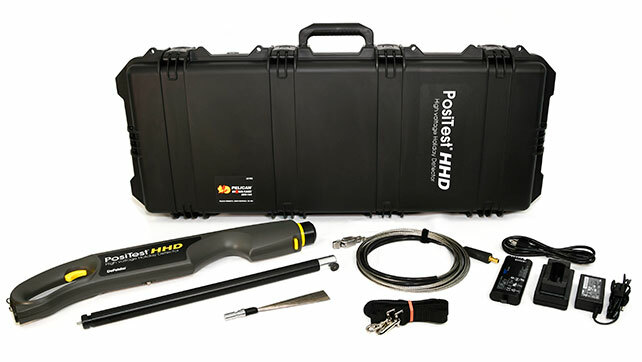 The PosiTest HHD is a high voltage holiday detector used for detecting holidays, pinholes and other discontinuities using pulse DC technology. 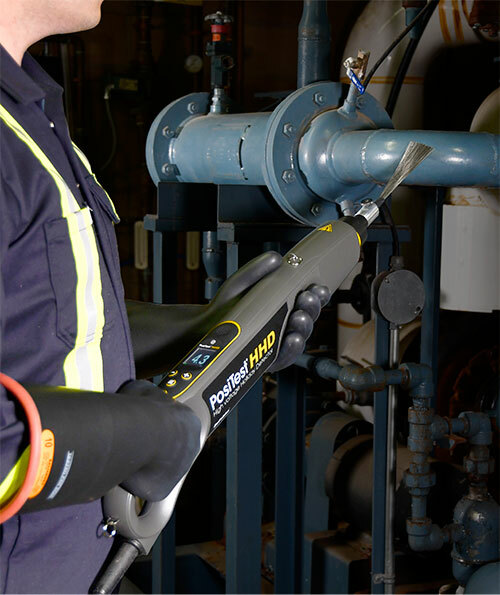 It offers a user-adjustable voltage range from 0.5 to 35kV for detecting holidays, pinholes and other discontinuities in coatings up to 780 mils (20 mm) thick. 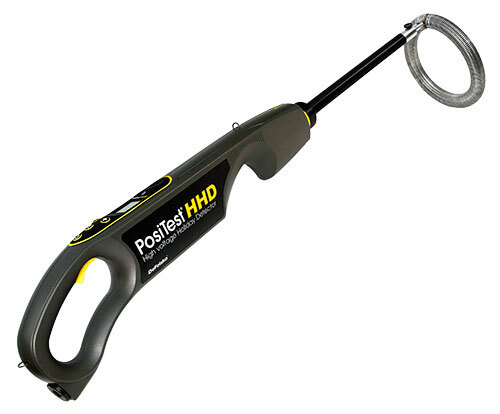 The versatile PosiTest HHD is ideal for use with a wide range of rolling spring and flat wire brush electrodes - custom sizes are available upon request. 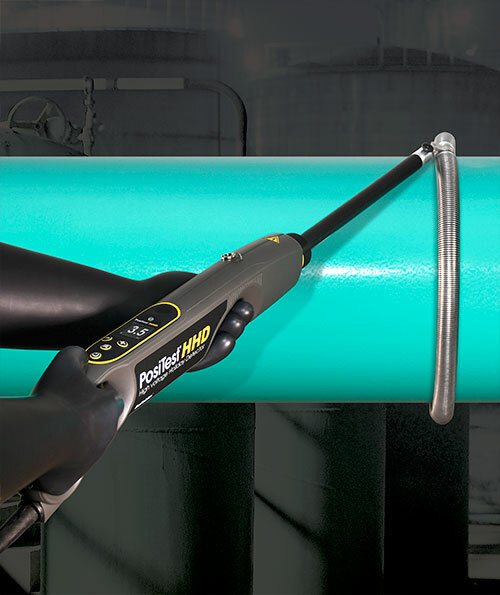 Alternatively, use existing electrodes with industry-standard adaptors. 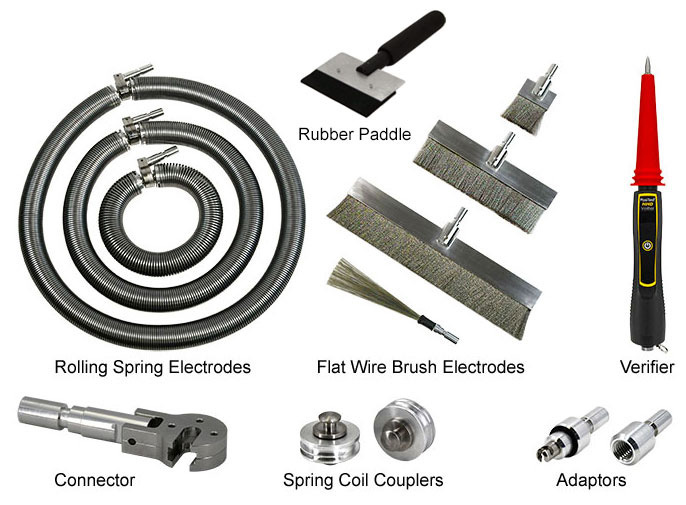 A wide range of rolling spring electrodes and wire brushes are available. Custom sizes available upon request. Strobe light and loud audible alarms emitted when a holiday is detected. Audio alarm mode can be adjusted for differing environments. Shock proof/creep proof - internally sealed to minimize creep distance to high voltage components. Designed in accordance with IEC 61010-1. Typical Battery Life: Based on selected voltage and load Ø 12" Rolling Spring @ 10kV, 40 hrs. Ø 40" Rolling Spring @ 10kV, 30 hrs. Spring Connectors connect the PosiTest HHD rolling spring electrodes. Rolling Spring steel pipe electrodes - assorted sizes available: 4 - 24" (10 to 60 cm) Rolling springs include two pre-installed spring couplers. Please Note: Each spring includes two pre-installed spring couplers. A spring connector is required to attach the PosiTest HHD to the spring couplers. Custom sizes available. Additional couplers (2 pack) are available.